Now we pass a low bank with a garden or two…..
……The next Inn was the Poplar, an old countrified-looking house with poplar trees in front of it. ..
… at 52 Bath Street in 1871. “The tavern deserved its name, for in front of it was a row of noble poplars, of which only one remains, a miserable relic of former stateliness”. (Bath Street in the Ilkeston Pioneer 1892). In September 1850 this inn was described as “having a frontage to Bath-street, of 43 yards, or thereabouts, and there is a well with a constant supply of excellent water, from which circumstance the property is well adapted for a Brewery”. At that time it was occupied by Matthew Elliott and he was still there on the 1851 census. It was subsequently occupied by Thomas Brown who makes an appearance in the Post Office Directory of 1855 as a ‘beer retailer, Bath Street’. In 1858 the Ilkeston News advertised for sale this “dwelling house occupied as a beerhouse and called the Poplar Tavern, in the occupation of Thomas Brown”. The Ebbern Family at the Poplar. And perhaps it was at this time that Marina Ebbern came to the Inn? Mrs. Ebbern, the landlady had two sons, and two daughters. A daughter of William Burgin-Richardson — framework knitter and one-time victualler at the Boatswain tavern — and Elizabeth (nee Attenborough), Marina Burgin-Richardson had married West Hallam farmer Francis Ebbern in September 1835, and then had lived in that village until the death of her husband in 1856. Francis had bought the land and premises in this area of Bath Street in 1851 from James Potter, coal agent and farmer. Born in 1840 their eldest daughter Elizabeth married Abraham Flint of West Hallam, coalminer son of William and Mary (nee Hobson) in January 1859. The Harrison & Harrod & Co. Directory of 1860 shows Abraham as a beer retailer in Bath Street — most probably at the Poplar Inn — while mother-in-law Marina is listed as a farmer at West Hallam. But by 1861 Marina had left West Hallam and occupied the Bath Street beerhouse, with three sons and two daughters, while Elizabeth and Abraham Flint were back in West Hallam with their daughter Mary and Abraham’s parents. Marina was still at the Poplar in 1865 but by 1869 the landlord was Joseph Rollinson. The 1871 census shows innkeeper William Green there (as Marina‘s manager?) but in July of that year the licence passed to William Ratcliffe who had left his Codnor beerhouse. In May of the following year the license passed to Patrick Derbyshire while William Ratcliffe went to the Glass House public house in Codnor — which Griffin Wagstaff had just left to come to Ilkeston’s Spring Cottage Inn, just vacated by George Wright. Patrick Derbyshire was at the Poplar until April 1878 although he ceased his brewery business there in February 1877 when he sold off his equipment. Marina died in December 1878, aged 61, at the Bath Street home of her married daughter Frances Amelia. Marinah Ebbern nee Burgin Richardson … married Francis Ebbern in 1835. He was a Coal Merchant from Coventry, whose family delivered coal by barge to the textiles industries all over the country. I think he must have stopped off one evening, gone to the pub and bumped into Marinah and fallen in lover – because her family ran the Boatswain according to your records. Sadly Francis died in April 1856 and I think that his daughter Annie Rebekah was born on 6th July, 1856 – so they didn’t get to meet. That must have been a torrid time for Marinah. Francis Ebberns name lived on in our family though. I have a photo of Annie Rebecca somewhere and will try to find it for you. My Dad, Francis Ebbern Robinson, was her grandson and said she was formidable! Francis is buried in West Hallam church and his daughter, Elizabeth is next to him. West Hallam is where he farmed once he had sold his share in the canal transport business to his brother Tom. (I am not sure which farm.) I guess that it was this money that funded Francis buying property in Ilkeston (including the Poplar Inn), some of the property remained in the family until the 1960′s when my Grandad, Samuel Sydney died and my father and uncle sold it as it was in poor repair! * The Boatswain appears in early nineteenth century trade directories occupied by William Burgin (1829) who died in 1830, then by his widow Elizabeth Burgin (-Richardson) in 1835, and then by their son James in 1841. I believe that around this time its name was changed to the Jolly Boatman (see Bagshaw’s Directory of 1846). The address of the Inn appears in various sources as ‘The Potteries’ or ‘Canal Side’. It is shown on the 1881 Ordnance Survey map of Ilkeston on the west side of the Erewash Canal, a short distance to the south of Barker’s Bridge, where Awsworth Road crosses the canal. If you look on Google Maps it was approximately at the east end of what is now Boatsman Close. After her marriage on January 18th 1859 Elizabeth continued to live at West Hallam with husband Abraham Flint and their children. She died there in November 1882, aged 42. Abraham died there two years later. Born in 1842, eldest surviving son and coalminer John Ebbern married Hannah Morris Carrington, daughter of Heanor Road coalminer John and Hannah (nee Morris) on September 7th 1862 and six children followed before Hannah died in August 1876, aged 33. Some time later — possibly about 1880 — John formed a relationship with Ann Powell (nee Wortley). She was the wife of labourer Matthew Powell whom she had married in October 1872, by whom she had had at least two children –Sarah Ann (1874) and Elizabeth (about 1877) — and from whom she was soon thereafter separated. Ann Powell alias Wortley then had a succession of illegitimate children who had a variety of surnames including Thomas Gideon Wortley (1880), Herbert Wortley (1882), William Ebbern Powell (1884), Thomas William Ebbern Powell (1885), Mary Ebbern Powell (1887), George Ebbern (1888) and William Ebbern (1890) though all but one died in infancy. When Ann’s third illegitimate child — an unnamed daughter — died in January 1883 after two weeks of life, without a doctor being called, the authorities became suspicious of these infant deaths and an inquest was held. Ann was then living with her parents at Lower Granby Street and her mother, Sarah Ann Wortley, had helped deliver the child. From birth the baby was sickly — according to her grandmother — had suffered from convulsions, had refused food, and was ‘half gone’. She had given it castor oil but had not called a doctor. What was the point? In her ‘expert medical opinion’ the child was beyond help, expecting every moment to be its last. The evidence pointed to convulsions as a cause of death, reflected in the jury’s verdict. The 1891 census now showed John and Ann living together as husband and wife, at 7 Lower Granby Street with their daughter Mary and Ann’s parents, horse driver Thomas and Sarah Ann (nee Wrath). However it wasn’t until 1901 that John and Ann were officially married. John died at his home of 22 Springfield Gardens in December 1905, aged 63, and Ann also died there in March 1912, aged 59. Tom married Mary, the youngest daughter of John Birch, joiner. Thomas married Mary Birch, daughter of South Street joiner John and Sarah (nee Wagstaff) on March 3rd 1872. He traded in Bath Street as a butcher, just below the Brunswick Hotel, near what was once the site of Moses Mason’s business… his premises had a frontage to both Bath Street and North Gate. This photo is from the family collection of Pam Bates … unfortunately damaged with the passage of time. 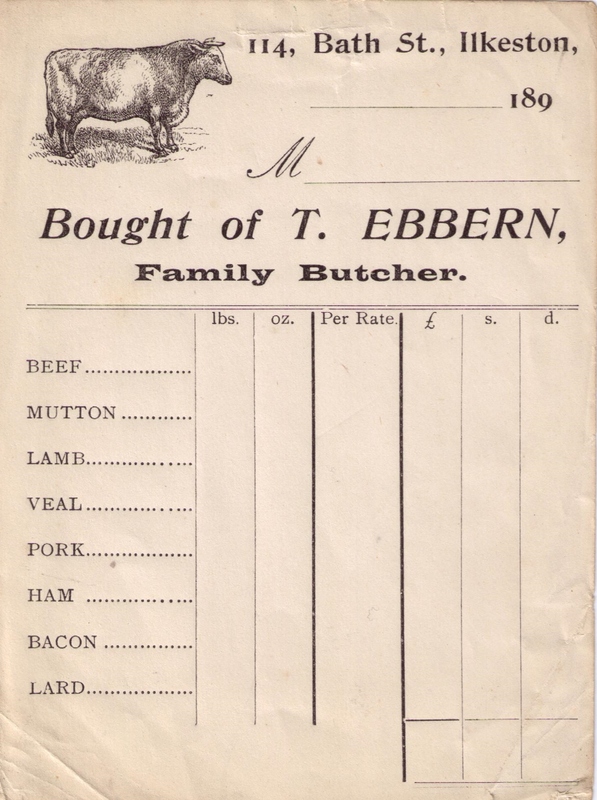 By 1881 the address of Tom’s butcher’s shop was 79 Bath Street (the Woolliscroft Store was 80 Bath Street). 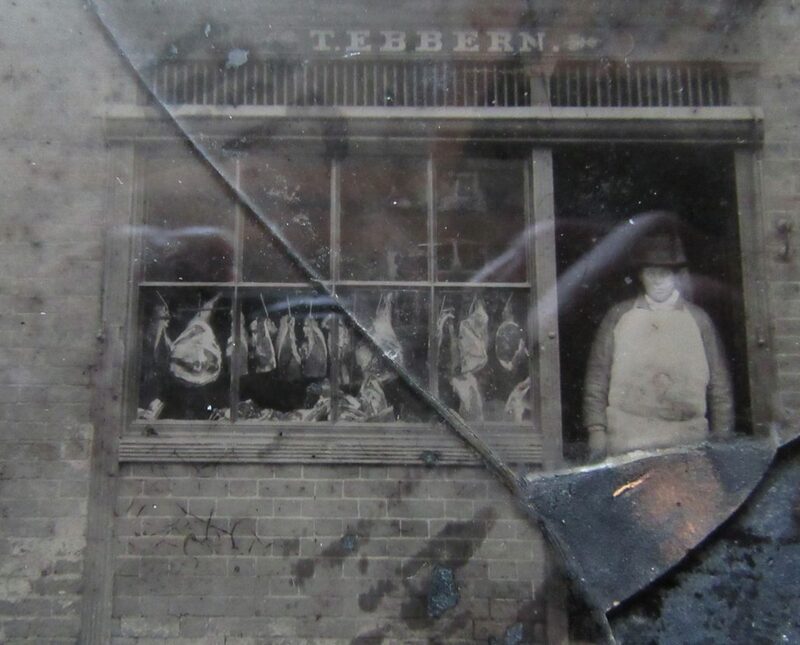 By 1894 the butcher’s shop address was 114 Bath Street. In 1899 the family dwelling, together with the butcher’s shop, stable, slaughter house, cow house, piggeries and other outbuidings were sold at auction and Thomas and Mary retired to Cossall where he died at Poplar Farm on January 26th 1907. Mary died on March 17th 1931, aged 80, and is buried at Kirk Hallam Parish Church, as many of her Birch ancestors are. ‘I was given one of (Mary’s) dresses by the caregiver of my twin cousins (now deceased) May and Elsie Paling (lived on Green Lane, Ilkeston). Their mother was Annie Paling, a daughter of Thomas and Mary Ebbern and the wife of Arthur Edwin Paling of Cossall (the couple married at Cossall Parish Church in 1915). ‘I also inherited from May and Elsie a music box/ photo album which plays a tune, full of old photos of Ilkestonians I don’t know but who are probably their ‘Ebbern’ relations’. She also notes that Mary was born on April 6th, exactly 100 years to her own birthdate ! 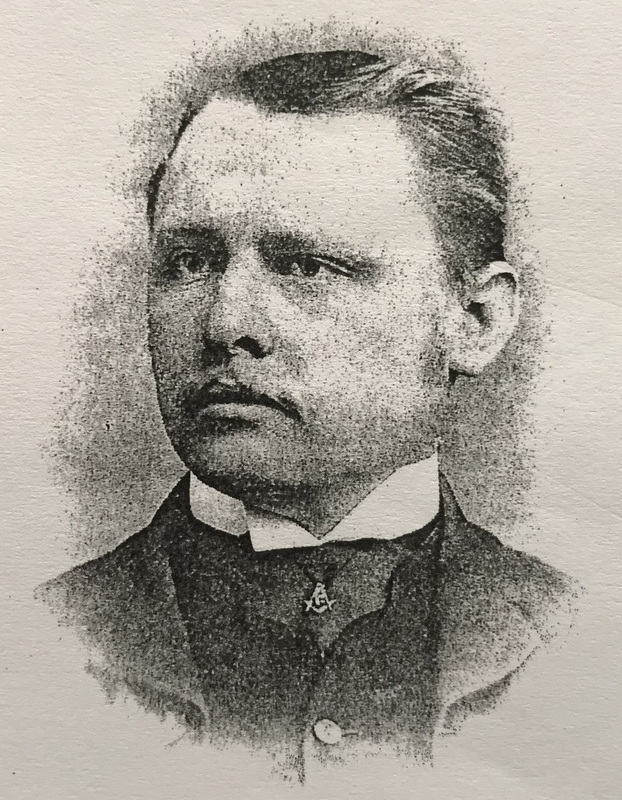 George Joseph (the second) moved out of Ilkeston to the Sheffield area where he worked as a railway engine driver and married Frances Hannah Chambers in 1876. About 1889 he and his family then emigrated to Canada where they settled in the Marquette district of Manitoba and where other Ebbern children were born. George Joseph died on February 1st 1937, aged 84, at Ellice, Manitoba. Frances Amelia gave birth to her illegitimate daughter, Edith Annie, in November 1874 and six years later married clerk Cecil Aldwinkle. The youngest daughter became the wife of Samuel Robinson, youngest brother of Robert Robinson, who was schoolmaster at Cossall for many years. Born in 1856 Annie Rebecca Ebbern was the youngest daughter who in July 1873 married Samuel Robinson, house painter, paperhanger and plumber, youngest son of William Hallaway Robinson, needlemaker and later coal dealer of Market Street, and Jane (nee Levers). Samuel Robinson at the Poplar. In late October 1876 Samuel appeared at Ilkeston Petty Sessions, accusing Bath Street grocer and draper (and superintendent of the United Methodist Free Church Sunday School) Joseph Carrier of assault with a dangerous weapon — an umbrella. Samuel had been engrossed in conversation with Silas Spencer and Edwin Trueman in South Street, when Joseph and his umbrella passed by. The grocer/draper thought that he heard a religious smear spoken by Samuel and intended for him. He was so provoked that he struck the master painter/paperhanger across the right arm with the umbrella, causing serious bruising. Samuel denied that his remarks were aimed at Joseph and the magistrates agreed that the assault was clearly unprovoked. The payment of his fine of 10s and 20s 6d costs was immediately forthcoming from Joseph together with a promise not to wield the umbrella against Samuel again. When he asked what he should do if he heard such remarks again, Joseph was told that the magistrates did not sit there to give advice, nor did they give summonses for ‘sleers’. In early 1878 Samuel took over as landlord at the Poplar Inn. In the following year he was placed fourteenth in the celery show held at his inn. There were 15 contestants. Samuel and Annie Rebecca were at the Poplar Inn in the winter of 1879 when Annie Rebecca’s cousin John Ludlam came to visit. He was the son of Henry and Jenny (nee Burgin-Richardson) and had recently been keeper of an inn at Motherwell, near Glasgow. For about two years he had been a heavy drinker, favouring a glass — or several! — of whisky; his brother-in-law Samuel Webster could testify to John drinking 18 glasses before tea-time. In the last few months he had been wandering around from place to place staying occasionally at the Poplar. And he was there on Christmas Day 1879, not a merry one for John. Cousin Annie Rebecca certainly didn’t allow John 18 whiskies before tea-time and he went to bed at about 6 o’clock in the evening, relatively sober but unable to keep any food down and vomiting violently. Despite medical attention, three days later he died at the inn, from congestion of the liver caused by excessive drinking. Samuel Robinson was elected the ninth Mayor of Ilkeston in 1898 — his appointment was unsuccessfully opposed by Councillor Joseph Scattergood, a member of the Ilkeston Band of Hope Union, on the grounds that Samuel was a licensed victualler and thus was not ‘a suitable person to occupy the civic chair’. A few months later both Samuel and Joseph were present at the opening, in December 1898, of Ilkeston’s first coffee house, the Lord Haddon Coffee House and Restaurant, immediately opposite the Town Railway Station in Bath Street. The idea for this establishment was first suggested by the Duchess of Rutland and it was she who performed the establishment’s opening. However it was her husband who gave the first speech, remarking that “it was of the utmost importance there should be one or more places where people of both sexes could meet together and have refreshments, and partake of ‘the cup which cheers but does not inebriate’”. With the new mayor/licensed victualler probably standing close by, his Grace diplomatically admitted that he had nothing against those who managed hotels or public houses. The Duke was followed by his wife, a total abstainer, who explained that total abstinence was “good for the health, good for the pocket, and uncommonly good for the temper”. She too judiciously added that she had the greatest respect for the Church of England doctrine which was not to go in for total abstinence but to allow its members to partake in moderation. After the speeches “an excellent spread was done full justice to”. .. but no intoxicating liquor!! Traffic warning! 9.30am March 24th 1881. The light trap of pork butcher Gilbert Wilkinson and boot and shoe maker Frederick Mitchell was travelling at speed down Bath Street when, near the Poplar Inn, it collided violently with an omnibus/cab driven by Richard Birch Daykin who had just picked up a passenger at the Midland Railway station. The trap and its horse were overturned, its shafts broken and the two occupants thrown six or seven yards away. The shafts of the ‘bus were also broken and the baskets carried on its top were hurled to the ground. We are now just north of the Poplar Inn, at what was called Potter’s Stackyard between the inn and (later) Pelham Street. This was at the southern edge of ‘Ilkeston Common’, an area which stretched northwards to include Cotmanhay up to about today’s Church Street. Across from us, on the opposite side of Bath Street is Twell’s Field, at the back of which is the Durham Ox Inn. In 1873 the stackyard was where the Rutland Colliery Company kept its stacks of hay, straw and clover. And it was there at midnight on a Saturday in August of that year that a large fire broke out. The fire engine couldn’t be called as the town didn’t yet have one!! Three of the stacks were consumed by fire, lighting up the whole of lower Bath Street, and causing excitement and apprehension among the spectators who had gathered. Neighbours rallied around and managed to transport one of the straw stacks across the road and into Twell’s Field. This was an opportunity for some toe rag to make off with several coats which had been discarded in the rescue efforts. In the 1860’s and 1870’s the Statutes fair would often ‘slop over’ from the Market Place into the Old Harrow Inn Yard, alias Aldred’s Yard, and at times, move into the Old Stackyard. And so to Samuel Whitehead, hero of Waterloo.